This is one of the most bizarre multiple-witness UFO cases ever recorded in the UK and it rivals the famous 1955 Kelly-Hopkinsville (Green Men Case) for strangeness. The entire 1994 Silbury Hill event is detailed in 11 pages by Andrew Collins in his 2012 book Lightquest. This article is only a brief synopsis of the events and subsequent experiences reported by the witnesses. The case is little known outside the UK but is clearly one of the most important cases in UFO history. The book Lightquest includes several full-page illustrations of the objects and the beings encountered by the witnesses. In July 1994 three people climbed England’s Silbury Hill and planned to spend the night atop the 131-foot high mound to watch for possible crop circle activity. The three people (two men and a woman) were soon met by two other friends, but the two friends left shortly before dark. A group of 5-6 teenagers was also on the summit of the mound at the same time. The teenagers fell asleep around midnight as fog began to encircle the mound and they appeared to be “frozen” or deeply asleep when the strangeness began to unfold. Around 1:00 am the three witnesses heard what they thought were the sounds of someone ascending the hill by coming straight up the side—not by using the spiral path that leads up and around the hill. Looking over the side of the steep mound they thought they could see small dark forms moving around, forms resembling children, but their attention was immediately grabbed by the sight of an orange fireball appearing about a mile away—slowly floating above the ground. When all three people looked at the orange, fiery orb another fireball immediately appeared beside the first. At that distance the witnesses described them as looking like flaming, orange torches. Immediately they smelled sulfur and something like burning rubber and they could hear dogs in the distance now barking wildly. The fireballs floated quickly toward the three witnesses and when the orbs were about 170 yards away from the mound, one of the witnesses turned on a flashlight. Immediately the orange orbs stopped moving. The witnesses then could clearly see a “structured form” hanging below each of the orange orbs. The balls of orange fire appeared to be about 2-feet in diameter, but the objects below each were larger. The objects under the orbs were tetrahedron shaped—a three-sided pyramid—and floating above the ground. When the flashlight was turned off, the floating lights continued moving toward them. They watched as what looked like electrical discharges occasionally flashed to the ground from the orbs. When the forms got closer, the witnesses were stunned by what they saw. 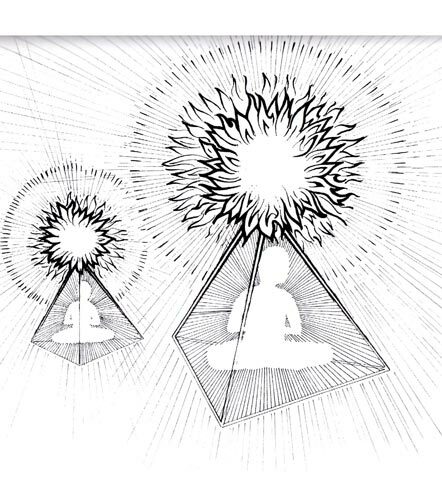 Inside both of the now translucent pyramid-shaped objects they could see a small being sitting with crossed legs and hands clasped on their laps. The beings were glowing orange and were estimated to have been 4-5 feet tall. The female witness — for reasons she could not explain — blurted out, “They’re little people.” The fireballs floated higher and eventually elevated to about 10 feet above the hill and about 15-20 feet away from the witnesses. At that point, everything seemed to mentally move in slow motion. They heard a cracking sound and what seemed to be whispering. One of the witnesses believed that the creatures were somehow communicating with them. As the orange glow from the objects was reflected onto the surrounding trees and the hill, both fireballs silently expanded in a massive and blinding flash of light. The orbs and dangling pyramid shaped objects reappeared after the light flash subsided and then floated down the hill, they then joined together into a single fireball, and moved over a nearby road to an adjacent field. It was at this point the most bizarre event occurred. One of the humanoid beings slowly emerged from the fireball, but as it emerged it was holding the hand of the other humanoid, also pulling it out of the orb. Both of the orange, glowing beings floated next to the orb, hand-in-hand, and then they re-entered the fireball. At that moment from behind the object several more orange orbs suddenly appeared, numbering from 3-4. Below each of these the witnesses could see a translucent tetrahedron with a small humanoid being sitting inside. The group of orange objects then moved away from Silbury following a road toward the town of Marlborough, illuminating the road as they moved. Unexpectedly, a car then appeared on the road moving toward the lights. In response, the orange orbs merged into a single light and shrank to the size of a tennis ball and rapidly jumped off the road into a hedgerow. As the three witnesses saw the car then hit its brakes, a man suddenly came up to the top of the hill and startled them. He said he had been sleeping on a portion of the other side of the hill and was awakened. Then, all 4 witnesses saw the tennis-ball size light reappear and rapidly move toward Silbury Hill and spin around it. Shortly thereafter the witnesses saw what they described as a string of multi-colored lights moving up a nearby hill and over it out of sight. The three main witnesses decided to tell no one about their experience, but for years thereafter they were haunted by the experience. Nightmares, fear, changes in career, and various other emotional issues emerged. Andrew Collins, who is well-known and respected in that area of the UK, extensively interviewed all of the witnesses while researching the book Lightquest and was convinced of their honesty. The first time that the story was publically revealed was in his book. The area around Silbury and nearby Avebury is a hotbed of strange reports: UFOs, crop circles, humanoids, strange lights, and apparitional phenomena are frequently reported. Around 2006 my wife and I stayed with the Collins’s for a week at Avebury exploring Silbury, the Avebury circle, and nearby sites. We spent several nights walking the standing stone grassy avenues leading for miles in various directions to different sites. Oddly, each night we observed small orbs of blue/green/white lights emanating from the hills running alongside the avenues.